eDR Europe is the Sole U.K. and European distributor of the HDC-V Hard Disk Crusher. We supply direct to any European, Middle Eastern, African or Asian destination. eDR Europe was formed to create a presence in EMEA and expand the already well established USA market of eDR Solutions LLC, headquartered in Greenville, South Carolina which was founded in June 2004. A leader in electronic destruction and recycling, eDR’s cutting-edge, patent pending disk destruction technology is the most reliable disk destruction solution on the market. eDR’s corporate vision is that recycling products should be safe, simple, and secure. Based on that principle, the Hard Disk Crusher has evolved as the #1 physical disk destruction product on the market today. eDR stands behind all its products, and strives for 100% customer satisfaction. The Hard Disk Crusher is currently used worldwide by privately held and public companies, federal agencies, defense installations, universities, asset retirement companies, and non-profit organizations. On 2nd September 2009 the eDR HDC-V Hard Disk Crusher was awarded the prestigious CCTM Certificate from CESG, the UK’s National Technical Authority for Information Assurance at GCHQ. The CESG Claims Tested Mark (CCTM) scheme provides a government quality mark for the public and private sectors based on accredited independent testing, designed to prove the validity of security functionality claims made by vendors. In more colloquial terms, the CCTM is designed to assure that a product or service does ‘what it says on the box’. eDR Europe are experts in the application and use of the HDC-V in commercial and operational environments for the decommissioning of hard disk drives. NAID-Europe is a standing committee of the National Association for Information Destruction (NAID), an international association of companies offering data destruction services, uniting to promote the secure disposition of discarded information by emphasizing the highest standards and ethics. The 2010 e-Crime Wales Summit will take place at Celtic Manor Resort, Newport on Thursday 15th July. e-Crime continues to cost the UK economy billions of pounds each year through many different threats; information theft, sabotage, theft of financial information and disruption to business. eDR Europe is proud to be Exhibiting at this Summit. Register here and see the Hard Disk Crusher in action. 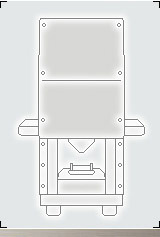 The Hard Disk Crusher (HDC) is patent pending.